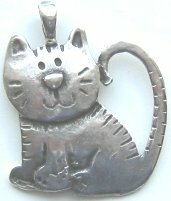 This all metal pendant features a smiling kitten looking right towards you. This metal pendant is 1 3/4" high x 1 1/2" wide. Antique finish. There is no mark on the pack of the pendant but it appears to be pewter. 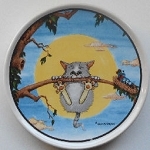 We have 7 of these kitten pendants.